Greg built my master bedroom closet and entertainment center. 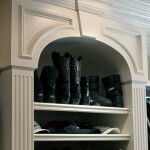 The closet was a really tricky job with arches and intricate crown molding. I’m super picky about quality and all I can say is it doesn’t get any better than this. 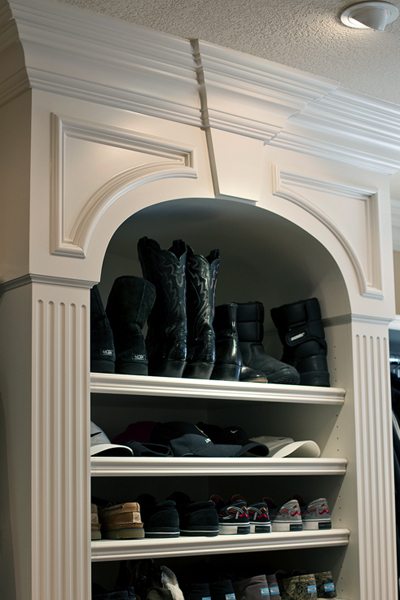 As you can see from the pics (click on the master closet and family room tabs at my home’s website), the woodwork is beautiful. If you need a carpenter, Greg is a great person to work with. We were introduced to Greg by our contractor during a home remodel. Greg seemed to be everywhere, doing everything. When the inevitable remodel problems arose, Greg was often there to help with the fix. He was prompt, reliable and his work was always excellent. Since we completed our remodel, we continue to look to Greg for many projects around the house, ranging from window hardware, shelving, door locks, and on and on. His work continues to be first rate, and he lives up to his promises. We consider him a trusted partner, and highly recommend him for any projects you may have. Greg and his staff are wonderful to work with. They did all the finish carpentry work for our house, crowns, bases, all the interior/exterior doors, ceiling details, etc. Greg has an artist’s vision and gave us his time and lend us his experience to perfect the design details. He and his men were efficient, professional and attentive to details. We could not be happier with the outcome. I highly recommend Greg Pautsch Building. Greg and his team did an outstanding job on all of the interior and exterior finish carpentry on our “Cape Cod” home in the Hunt Club. Greg was excellent at design interpretation and attention to detail, delivered the highest quality work and service, and worked exceptionally well with the team building our home. I highly recommend Greg and his company.